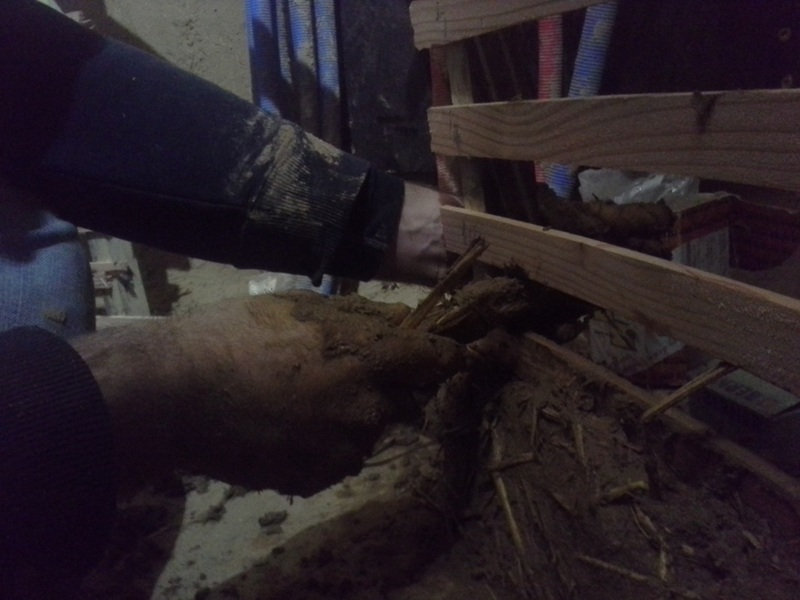 The "Coat Rack technique" is a technique we came up with by accidently combining two traditional techniques: 'Wattle and daub' and 'Light straw clay'. 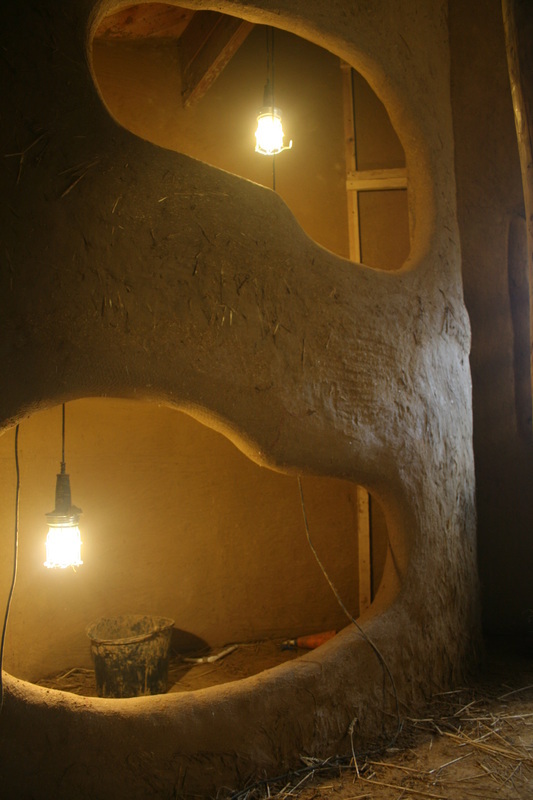 It's a way of building thin loam structures with a high straw and loam content. 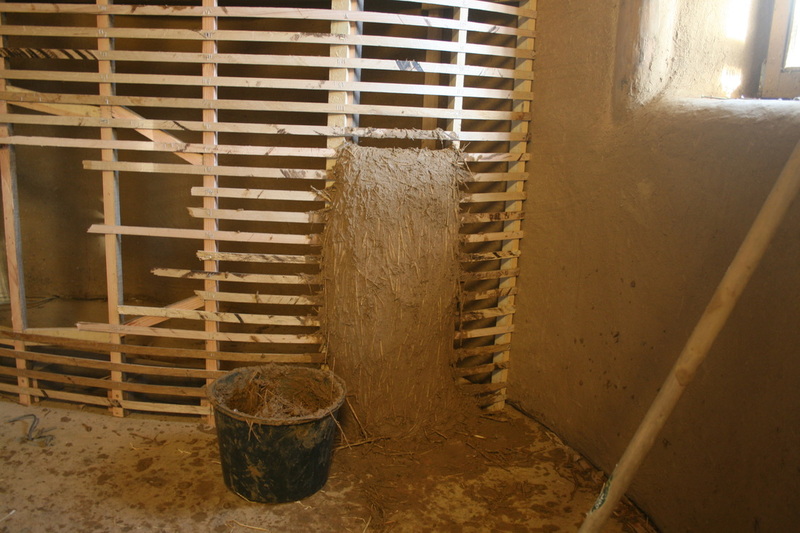 The big amount of straw makes the structure resilliant to movement and vibrations (no cracks!). 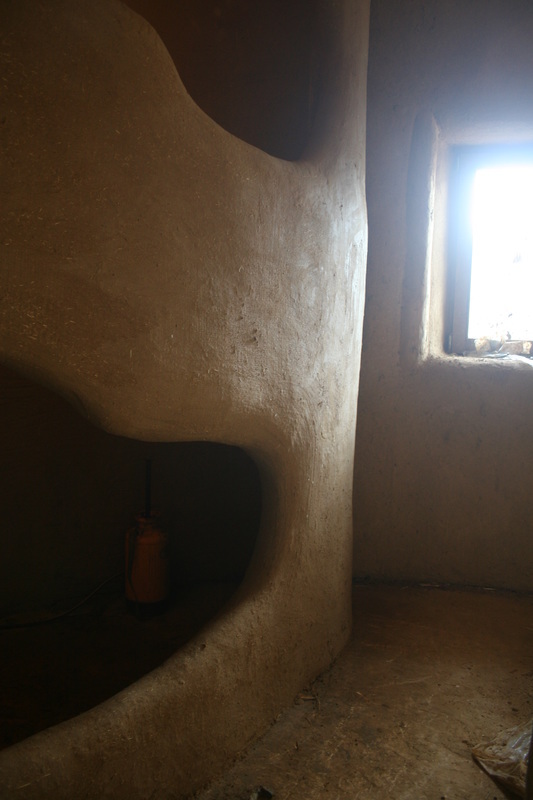 The big amount of loam makes it solid and strong. 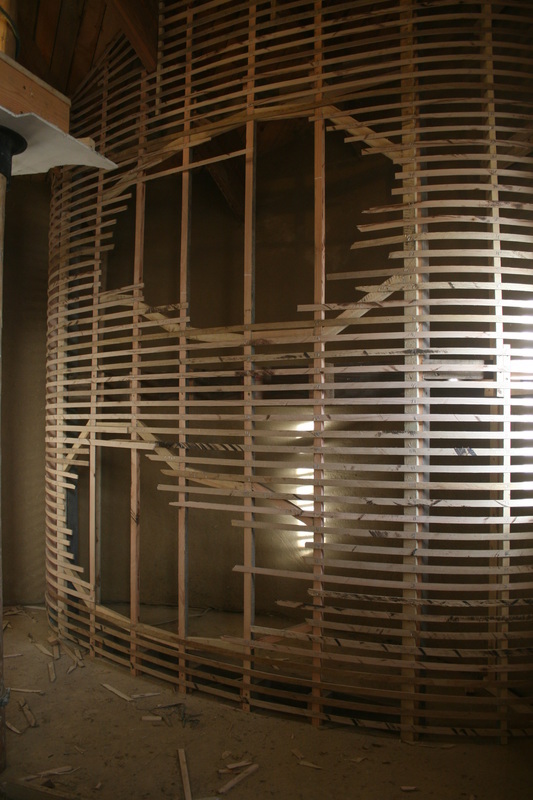 Basically you can build thin walls in organic shapes with a remarcable strength. 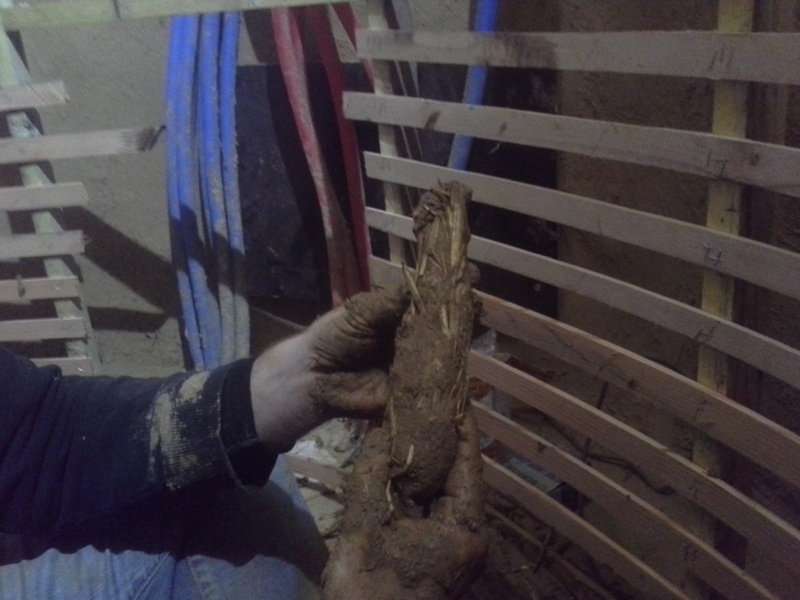 Just like 'light straw clay' the Coat Rack technique is based on coating the straw with a layer of dirt, but in stead of using a very thin coat of pure clay (Light Straw Clay) we use a thicker coating of loam. 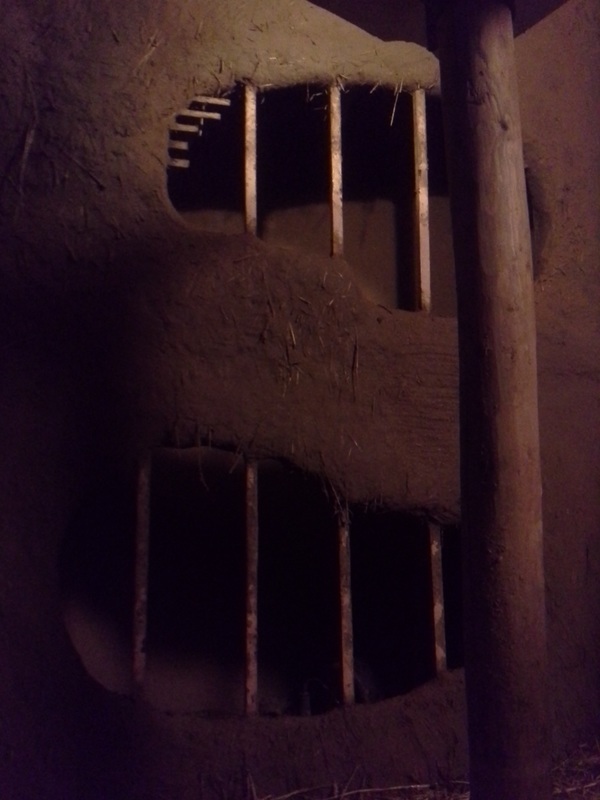 Just like Wattle and Daub, we use a wooden structure as a base to form the wall ('coat rack'). Build the skeleton of the construction: First you can build a strong basic frame. 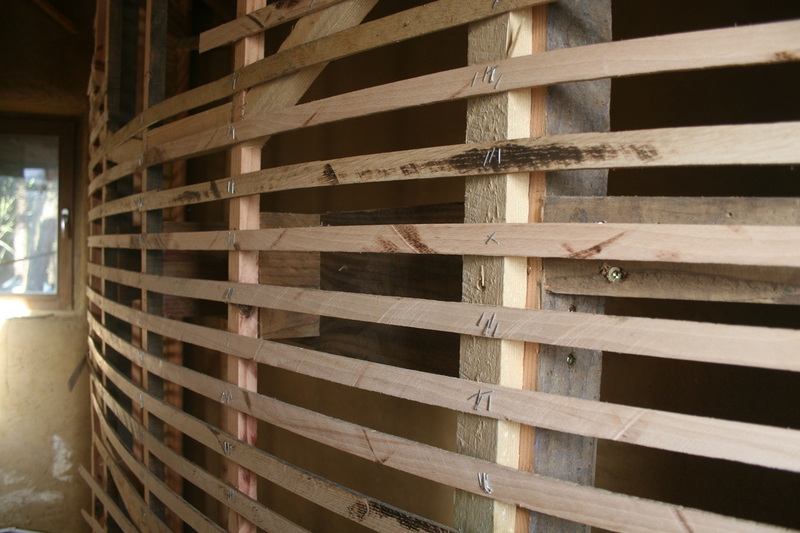 The frame will have to keep the whole wall from falling down and gives it an initial strength and elasticity. To give you an idea, the wall we are building here will weight about 1,6 tons!!! Of course, the thinner you can build your walls, the lighter it becomes. On top of the base frame, we staples sticks. Be sure to leave gaps in between the sticks wide enough to pass your hand through. I used leftovers of beech, because this type of wood is excellent for bending. But pine works as well. Make a pretty wet clay-sand mix. Take a bundle of straw fibres and "coat" them with your loam-mix. You can even add water to your loam mix untill it becomes fluid (like oat meal) and dip your straw fibres in it. Just make sure the straw is fully surrounded by loam ('coated'). ​Now make a sausage with the mix. Put the sausage through the holes between the sticks. ​Compact it to make sure there are no air bubbles inside. Now repeat step 5 untill you get a solid mass. Just make sure everything is nice and compact. This is a time consuming process. 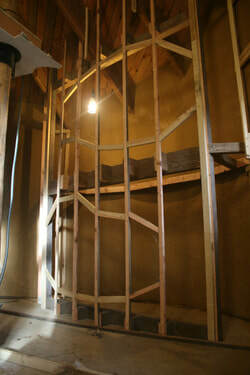 To build the bedbunks it took about 11 days with 2 people, working on it 8 hours a day. Notice how we kept the vertical poles in place to prevent the wall from collapsing around the cutouts. When the loam is "leather dry" it will allready feel sturdy: You will feel almost no movement when you push the wall. ​This is a good time to remove the support poles. 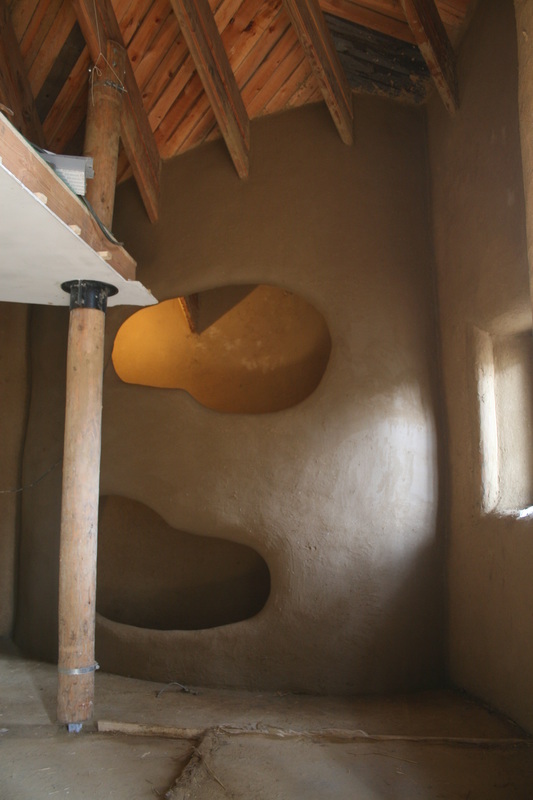 Finally when all this is done, we can finish the walls by adding a normal loam plaster to the wall (read more about loam plastering here) ​. This will fill up the irregularities. Remember to use smaller strawcuts the more you are geting to the finished surface. Also add more and finer sand the more you progress to the outside. This will prevent dust and make a harder top layer. This can all be done by hand. 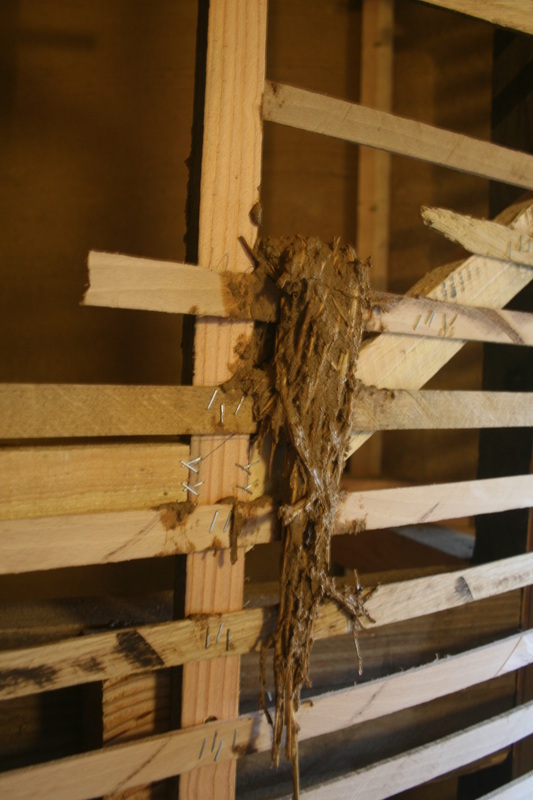 When the form is pretty smooth and still wet, add a wide mazed jute netting to reinforce the wall and prevent cracking. I usually put a thin layer (a few mills thick) of very wet loam on top of the reinforcement netting to have a good bouding. Now the wall is ready to add a last layer of render (no more than 10mm thick!!) this should be done with a trowel to get a smooth, dust-free finish.